Here is a video featuring beautiful inspirational Buddha paintings by artist Juul. “Autumn afternoon . 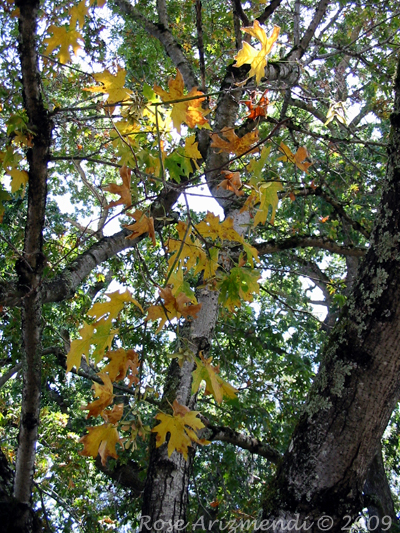 . .
On my walk this morning I noticed the leaves are gradually losing their color, a tattle-tale sign that tells us autumn is here. I had my camera with me so I took a photograph of this tree near our home. I always feel a little sad and reflective when summer ends and the days grow shorter. But I do love the subtle shift in the light especially in the early mornings, and the soft golden glow that wraps itself around our hearts reminding us, change is upon us. Here’s a magical sound effect created by a group of people using their hands to make the sound of rain. Beautiful!